They also have a section with historical data and from there I can ascertain that in Burnham-on-Crouch, the average annual rainfall Since 2006, has been: 518.4 mm (close to the Met Office Shoeburyness average for 1980-2010) and that the rainfall recorded for the current 12 month period is a little higher: 530.0 mm. This is less than half the UK rainfall total for 2017 of 1133 mm and less than the average annual rainfall than places like Sydney, Australia (1083.4mm); Rome, Italy (740.7mm); Barcelona, Spain (640mm); Singapore (2340 mm); and Miami, Florida, USA (1314.1mm). water supply schemes and initiatives. 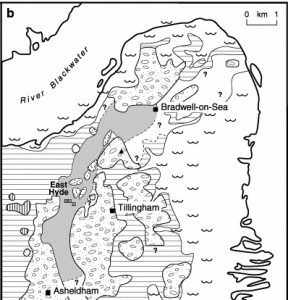 This is why Essex & Suffolk Water draw on a catchment area beyond their titular counties (as noted in Where You At Q1: Trace the water you drink from precipitation to tap). One useful thing you can do with the average rainfall data for where you live is calculate how much water you could capture of a roof. You need two other pieces of data – the area of your roof, and what’s known as the ‘run-off co-efficient’ of your roof (which is the average percentage of rainwater that runs off the type of material used on your roof). 90m² roof x 519.4mm average annual rainfall = 46.745 litres of rain falling on the roof in an average year. 46,745ltr x 0.9 = 42,071.4ltr running off the roof in an average year – and potentially available to capture and store. According to the water watchdog, the Consumer Council for Water, the average annual water usage in a 4 person home is 165m³ (165,000ltr) – so nearly 40% of that water demand could be met by harvesting the water off our 90m² slate roof. Without changing water consumption habits that rainwater could potentially fulfill the domestic water demand for toilet flushing, washing machines, washing cars and watering the garden – tasks that don’t need ‘drinking quality’ water. Some decent government legislation around the codes for new buildings – requiring rainwater capture – plus incentives and advice for existing homeowners could probably mitigate drought risk, increase household resilience and avoid large infrastructure costs. That’s the kind of thinking and action I would like to see in Essex. Next up: I’ll try and answer – When was the last time a fire burned in your area? Previous Post Where You At Q3: What soil series are you standing on? Next Post Where You At Q5: When was the last time a fire burned in your area?